I had a visit last fall from photographer Greg Preston, who snapped this picture of me lounging indolently in my studio. This is my "prop worktable". In between illustration assignments, I keep busy designing and fabricating props for movies and television. At the time Greg shot this, I was working on 5 shows at the same time, so my shop is even more messy than usual, if that's even possible. This photo was taken for a second volume of Greg's book THE ARTIST WITHIN. The first book is amazing - I highly recommend it. 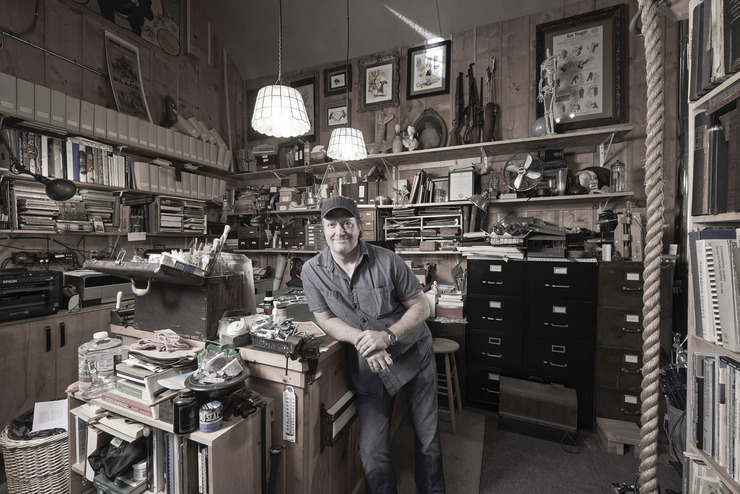 He photographed over 100 great illustrators, animators, and cartoonists in their studios. Jack Kirby, Jules Feiffer, Al Hirschfeld, Moebius, Shary Flenniken, Art Spiegelman, Carl Barks, Will Eisner, Alex Toth, Ed "Big Daddy" Roth, R. Crumb, Arnold Roth, Peter De Seve, Adrian Tomine, Peter Kuper. It's a veritable smorgasbord of amazing talent. It's always interesting to get a glimpse at other artist's working environments. Some looked like they had just had a cleaning crew in, or maybe they really are that neat and minimalist. But most studios looked like the kind of place I'd feel right at home in - pencils in jars, half-finished work on drawing boards, art supplies jumbled on tables, fun stuff on the walls, papers and books spilling out of shelves - heaven.